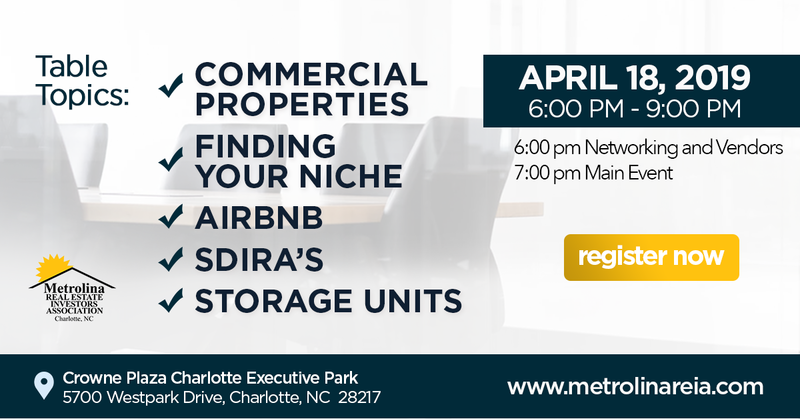 Metrolina REIA's April 21st Event will be PACKED with valuable information on several time-tested real estate strategies. Hear from FIVE local experts who will explain their investing niche in a short presentation as you rotate through each area of the banquet hall. Listeners will have an opportunity to ask questions of the presenters at all 5 tables. Put on your thinking cap! This will be a fast-paced event to glean as much information as possible from some remarkable investors in our community. Finding YOUR Best Investment Vehicle Fit. This Event is FREE for Members and $15 for Non Members.